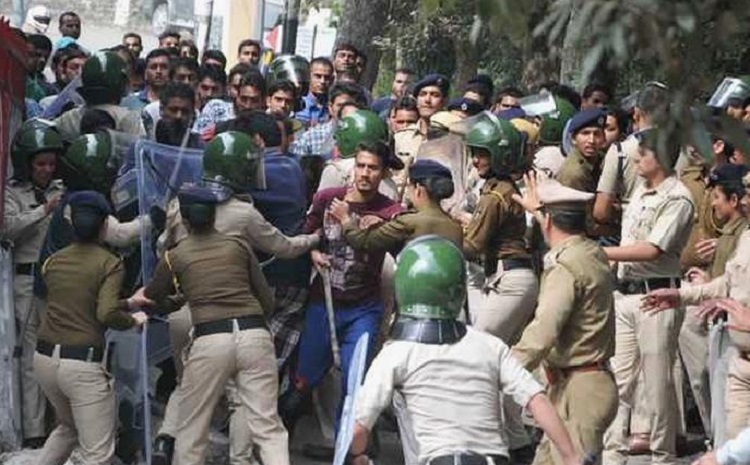 Shimla: During past five days Himachal Pradesh University has witnessed consistent tension and bloodshed in student clashes. The campus has, indeed, caught up in a loop of assaults and revenge. Unfortunately, the tension erupted right before the visit of 11-member team of the National Assessment and Accreditation Council (NAAC), which arrived at the campus on Monday. The team is on four day visit from October 3 to 6 during which it will inspect entire varsity facility to determine academic standard and rank. To present a clean and academic image of the institution, HPU administration had negotiated with SFI activists who were on a 150 day long chain-hunger strike. Varsity had also recruited about 60 faculty members to fill the vacant posts. Long awaited library for blind students and provision for their free education was also implemented recently ahead of the NAAC meet. Whatever service HPU provided to students recently on the name of Wi-Fi facility was indeed part of the preparation. Still varsity is short of many facilities and faculty members. To grieve the situation, on the night of October 2, 2016, armed student clash started at HPU’s Tagore Hostel in which about 20 students sustained injuries. About six students were arrested by Sunday morning. When clashes and brawl continued on Sunday too, additional police force and QRT team were deployed at the campus. Administration couldn’t prevent clashes before arrival of the NAAC team on Monday. 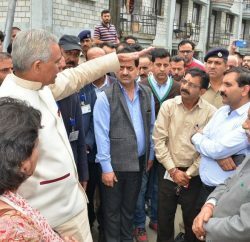 Heavy police security and stone-pelting welcomed the NAAC members on the very first day of its crucial visit. While administration is focused on facilitating the visit, tension increased on Wednesday as again two student groups shed blood at the campus. Police had to resort to lathicharge to disperse the rioting students. On Wednesday, Over 20 students were arrested. Tension still grips the campus. Police is raiding boys’ hostels to seize all sorts of easily available weaponry including sharp-edged swords, stick, to sacks of bricks from rooms. The NAAC team couldn’t ignore the tension and did inquire about it. The team said it is not unaware of the ongoing violence at the campus. Chaos is what depicts atmosphere at the varsity cause of which is being blamed on each other by SFI and ABVP. In FIRs both student bodies alleged attack from rival group who were armed with sharp-edge weapons, iron rods, stick etc. SFI alleges ABVP started the violence and vice-versa. Reportedly, prior to that a research scholar was abused and threatened in his room by one of the organizations. Amid chaos and blame game, it is not certain which one of them ignited violence. But since Sunday morning began a self-repeating loop of unending clashes between SFI and ABVP despite heavy police security at the campus. Two tribal students were attacked on Monday while they were on their way to welcome the NAAC team. The assault was followed by stone-pelting in afternoon. Next day, two girl students also alleged some students of passing sexist remarks and giving life-threat despite presence of police. SFI had also alleged that the police department was sparing ABVP assaulters, arresting only SFI students, and filing fake cases against SFI leaders. Amid this, a controversial statement made by the Additional Director General Police, AP Siddiki enraged SFI. The ADG in a statement to media had said that SFI had launched an assault while under influence of liquor. However, SFI challenged the statement on factual grounds and called it politicized statement based on incorrect information. So far, about 22 SFI and 17 ABVP activists have been arrested. Six SFI leaders were sent on police remand after filing various charges including attempt to murder against them. On September 29, 2016, tribal students have filed a complaint at Summerhill Police Chowki alleging ABVP leaders of harassment with passing casteist remarks. However, as alleged by the HPU Tribal Student Association, police did not took it seriously and it led to violence on October 2, Gandhi Jayanti. Tribal students claimed that if police had taken timely action, all the violence could have been prevented. Attack on two tribal students including the president of the association on Summerhill Chowk, as alleged, by ABVP activist hint that the tension had grew between ABVP and tribal students gradually. The brawl had reached even HPU library which was ransacked following Saturday night clash. Common students are hit by this high tension drama with sudden eruption of violent clashes. Some hostel students have preferred to leave the hostel until the situation calms down. There is no need to mention that academic atmosphere, which was earlier damaged by RUSA and massive fee hikes, has further degraded in view of current situation. Moreover, deployment of police force and checking of identity cards make students feel like they are entering into a fortress, in the middle of a war between two student outfits. The Vice-Chancellor had not given any statement regarding it except appeal to students to maintain peace at the campus. Similarly, higher officials of police department are urging students to stop rioting to prevent further aggravation of the tension. Strict action is anticipated from the Vice-Chancellor after departure of the NAAC team. Administration hasn’t announced any inquiry yet. Majority of public share the view that such violence by students of a higher educational institute is beyond their comprehension. Education is meant to make people more civilized, but at HPU students are behaving like savages. Such unacceptable behavior of students outfits made varsity face humiliation in from the NAAC team. 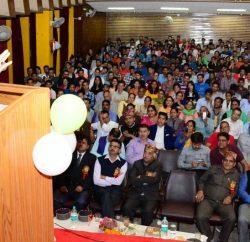 Chief Minister Virbhadra Singh also made clear that his government won’t tolerate students’ indiscipline in the institutes of higher education.